Christmas is just around the corner. I love Christmas - the city comes to life with all those lights and Christmas markets. I remember when I was a child, I adored to go for a walk with mom and dad among all the toys and garlands around us. It was so magical... Now when I am already big I haven't forgotten the spirit of Christmas because the kid in me is still alive. I decided to surprise you with these cute Christmas clip arts which are perfect for use on your holiday projects just in time for Christmas! 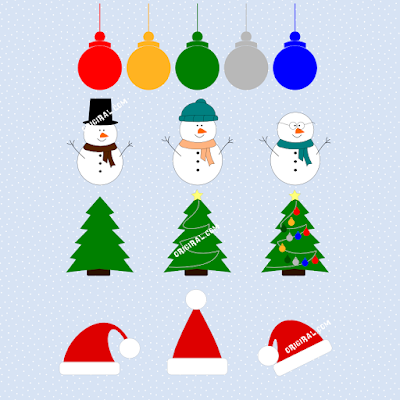 Balls, Snowmen, Christmas trees and Santa hats come to you in PNG (with a transparent background) and JPG format. Also includes a file in SVG format perfect to use as graphics in most programs and cutting machines. You can create with this 14 Christmas clip arts set: scrapbooking, stationary, invites, invitation cards, Seasons greetings cards, Christmas cards, wedding invitations, cupcake toppers, party decorations, party favor tags, label stickers, gift wrap, packaging, t-shirt, baby clothes, buttons, pendants, holiday gifts, print on fabrics... and so much more!